Process Description, EnviroPower Renewable Inc.
Advanced air fed gasification technology developed by EPR enables the rapid and near complete conversion of carbonaceous materials, such as biomass waste, to a low Btu fuel gas. This gas can then combusted in a LoNOx burner to produce steam for district heating or cooling, industrial processes, or for generation of electrical power. Depending on the overall waste derived fuel moisture, ash content and calorific value, the process generates just under one MWh of electrical energy for every metric ton of fuel introduced. Air emissions from the process are exceedingly low, allowing power plants up to 100 MW (nameplate) to operate under USEPA synthetic minor source air permits. Residual solids from the process are inert and carbon free and can be used for construction fill or landfill daily cover. - Treatment and clean-up of flue gas from the boiler prior to release to the atmosphere. 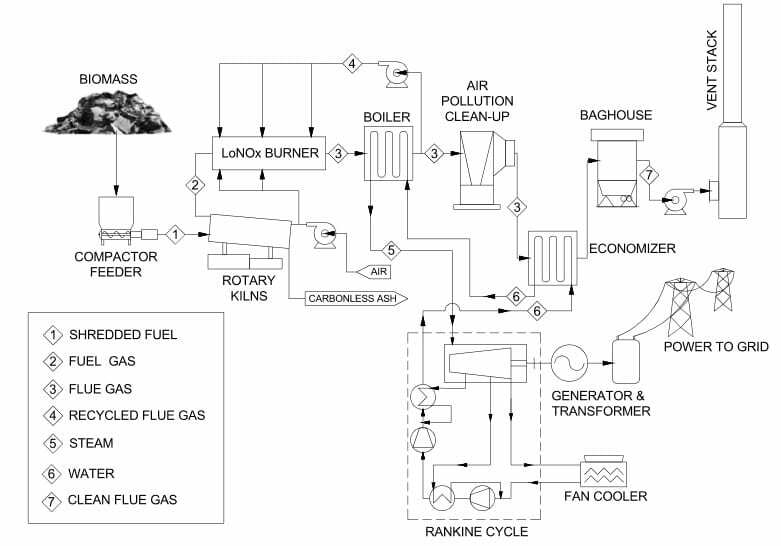 Shown below is a process flow diagram for a typical EPR waste to energy gasification line. Major process streams are identified by number in the table at the lower left. For more information on EPR patented and patent pending gasification technologies, see the Technology White paper accessed from the Library menu. Flue gas recycle (FGR) is a proven means of reducing NOx emissions. FGR systems divert a portion of the cooled flue gas leaving the boiler to be mixed with the combustion air and fuel gas entering the burner. In the case of the boilers in EPR rotary kiln waste to energy plants, recycle of the flue gas also helps to control the temperature of the hot gasses entering the boiler. This proprietary design helps reduce fouling of the boiler tubes and extends boiler service life. Shown below is a color coded layout of an EPR tandem reactor gasification line with flue gas recycle. The the thermal generation components of the plant are shown in Green, the heat exchange and steam production components are in Blue and the flue gas recycle and clean-up components are shown in Red. An isometric view of an EPR tandem reactor gasification line is shown below. In this configuration, carbon containing ash from two shallow bed updraft gasifiers is conveyed to a rotary kiln, which can also accept ancillary fuels such as tire shreds or medical waste. Temperatures in the rotary kilns are sufficiently high to assure full conversion of the carbon in the ash, and in the ancillary fuels to fuel gas. Solid residue leaving the rotary kilns is an inert non-hazardous and carbon free sintered material that is suitable for use as landfill daily cover or as construction fill. Each of these modular systems can be scaled to process up to 480 tons per day and produce between 16 and 24 MWe or renewable electrical power. Reforming of the raw producer gas from the gasifiers can be carried out using air, steam, recycled flue gas, oxygen, or any combination of these gasses. Reforming with oxygen is particularly effective in cracking any tars in the raw gas to make it suitable for pipeline transport in cases where a low Btu gas customer is located within a reasonable distance. Rotary kiln gasifiers are a proven technology that is considered robust and dependable. 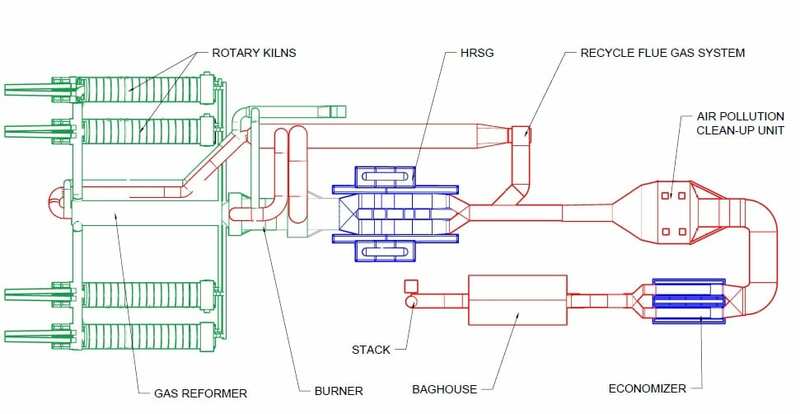 EPR gasifier systems are comprised of a primary rotary kiln reactor, a reformer and LoNOx burner, heat recovery steam generator, flue gas treatment units and a control system. Rotary kiln gasifiers can be specifically designed to operate on biomass, mixed combustible solid waste, and certain hazardous solid wastes. The operating temperature of primary rotary kiln reactor is normally in the range of 1,000 °C. The steel kilns units are refractory lined with an insulating castable and a hard refractory which can be operated up to temperatures of 1400 °C. 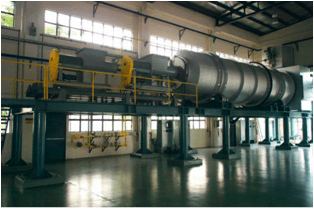 Smaller, high temperature rotary kilns (up to 1450 °C) can also be used as sintering units that are ancillary to larger primary rotary kiln or fluidized bed gasifiers. Rotary kilns have the advantage of being able to operate over a wide temperature range, depending on the design and refractory used, and can handle a variety of waste components. 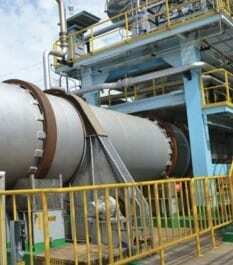 Rotary kiln systems are normally used at scales of approximately 50 to 200 tpd in a waste treatment capacity. For solid waste application, these gasifiers systems have a specially designed reformer and LoNOx burner to assure maximum oxidation and minimal particulate emissions. They can be fitted with various options for emissions control, heat recovery to steam, hot water, and electricity. Rotary gasifiers can be built in modules comprised of multiple kilns each, connected to a single reformer and LoNOx burner unit, boiler and air pollution control system. © 2019 EnviroPower Renewable Inc.